Happy smiles at the Royal Highland Show when Sarah Houlden and family dropped in with a magnificent cheque for £1000, raised at the 2016 Strathearn Eventing spring hunter trials. Since its inception in 2012 the Grass Sickness Hunter Trials have become a firm favourite in the Scottish calendar, giving riders the opportunity to test their skills over Strathearn’s superb course and ground. This year over 230 competitors took part, with an army of volunteers in support. 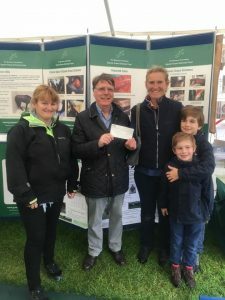 Keith Mason, chairman of the Equine Grass Sickness Fund thanked the Houlden family for their continued support, which has raised over £5500 for EGS research since the hunter trials began. Sarah Houlden said ‘the disease has been horrific this year and hit badly. We are all subject to it and if you own a horse every penny counts in trying to find a cure’.